This setting adds links beneath the table that allow you to navigate to the first or last data record on the first or last page of the table respectively. This setting adds links beneath the table that allow you to move to the previous or next page of the table. Shows links to the page numbers of the table so that you can switch to the individual pages directly. 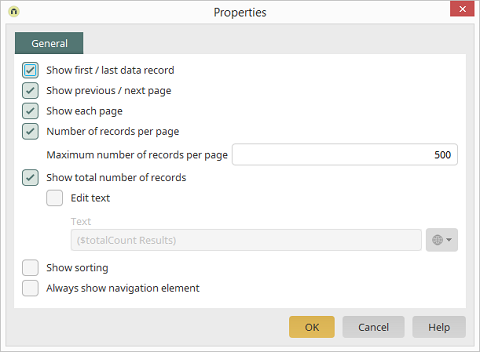 Adds a drop-down list in the browser that allows you to set how many data records are shown per table page. A user will not be able to select a higher value in the browser. If you select the value -1 as a maximum number, the highest value that can be selected in the browser will correspond to the number of data records. The sum of all data records that are contained in the table (including pages that are not visible) will be shown. By default, the sum is determined with the function "$totalCount results". If required, you can enter a text of your choice or use a constant that provides the text. This displays a drop-down list that allows users to select a data field to sort the table by. In a further list, the sorting in the browser can be set as descending or ascending order. If this property is not set, the navigation element will only be shown if the table contains multiple pages.